The Cordillera Blanca climate is determined by its relation between the damp air that come from the Amazon basin to the East and the dry desert air that come from the West; also by it is proximity to the Equatorial line. 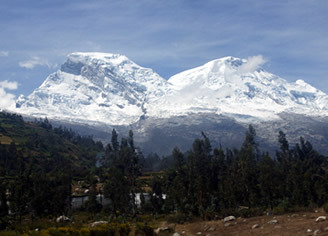 The rainy season spans from October through March, and the dry season, also known as the “Andean summer “spans from April through September; during these months the weather is stable with one or two bad days per week; in this months the most activities like trekking and climbing take place. A typical day in the Andean summer in the Cordillera Blanca, begins without clouds in the sky and it becomes warm at the noon reaching 20 ºC at 4000m / 13123 ft; but the mornings and the afternoons are cold and falls below 0 ºC. Generally the wind is not a problem in the Cordillera Blanca during the Andean summer.